Here's a pirep of one of my very favorite little biplanes. It's a lot of work to build, but simple as a Cub, both in it's structure and its personality. And it just oozes fun! Biplane! The very word conjures up images of endless flat, checkerboard fields, their color bleeding off to horizons so distant it is almost possible to see the Earth’s curvature through the maze of clustered wires and struts. The image conjured up by he word is almost never that of a modern biplane, such as a Pitts or Starduster, but is of some generic oldster that comprises little of today, but lots of yesterday. Biplanes of the mind are soft, friendly, lifting contraptions happy to call hay fields home and make every pilot feel comfortable and wanted. As soon as the term “homebuilt” was put in front of he word “biplane,” the imaged changed drastically. The soft, forgiving image became one of extreme maneuverability and hockey-puck sink rates, or richochetting off the runway and having the mouth dry out on final. 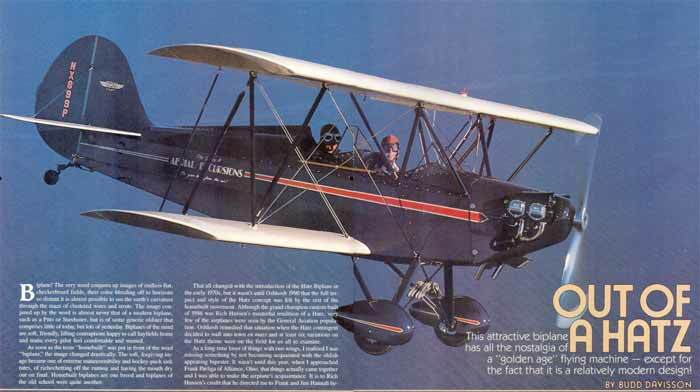 Homebuilt biplanes are one breed and biplanes of the old school were quite another. It's really a crime that John Hatz didn't live to see how popular his little airplane has become. That all changed with the introduction of the Hatz Biplane in the early 1970’s, but it wasn’t until Oshkosh 1990 that the full impact and style of the Hatz concept was felt by the rest of the homebuilt movement. Although the grand champion custom built of 1986 was Rich Hansen’s masterful rendition of a Hatz, very few of the airplanes were seen by the general aviation population. Oshkosh remedied that situation when the Hatz contingent decided to waft into town en mass and t least six variations on the Hatz theme were on the field for all to examine. As along time lover of things with two wings, I realized I was missing something by not becoming acquainted with the oldish appearing bipester. It wasn’t until this year, when I approached Frank Pavliga of Alliance, Ohio, that things actually came together and I was able to make the airplanes acquaintance. It is to Rich Hansen’s credit that he directed me to Frank and Jim Hanna because he felt as if his airplane had received more than its fair share of attention, as past grand champion. He wanted folks to know there was more than just one Hatz flying around. The next morning, when I approached Frank's airplane, I could see Rich had made a good decision. Even the most casual examination showed his machine to be a study in the attention to detail which is so essential in producing an outstanding homebuilt — or anything for that matter. As it happens, Frank comes by the attention to detail honestly since he and his dad, Frank Sr., have been building Pietenpols for many years. As they put it, "We were looking for something with the soul of the Pietenpol and the Hatz appeared to be a biplane Pietenpol. In looking back on the building of the airplane, Frank says little was difficult, with the possible exception of trying to keep it a secret from his father. He wanted to surprise him so, for the first three years, his father had no idea there was a new project in his son's shop — even though they lived only 50 miles apart. When the airplane had the raw covering on, Frank Jr. assembled the airplane in his drive and invited his dad over for dinner. From that point on, Sr. became a vital part of the airplane's progress as he pitched in to help with every aspect of the finishing work. Frank said the airplane presented absolutely no unusual building challenges other than the sheer task of building four wing panels that big. With a wing span of 25 ft 4 in, although the parts are far from being complicated, there are lots to be made and stuck together. Of the four years consumed in the construction, half that time was spent on the wings.